This sketch was done by the roadside, the main thoroughfare in March this year. See the black car? It was posing to be a very dangerous partner. 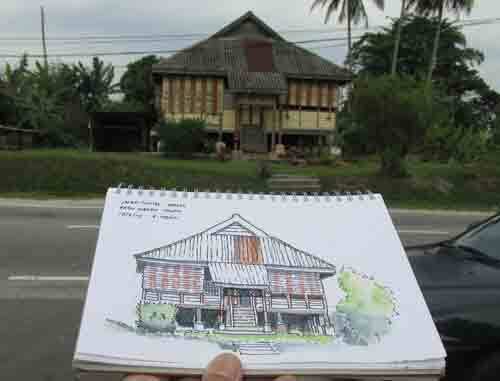 I came across a pair of wooden houses in Jalan Pusing, Batu Gajah, Perak, as I was driving into town. The duo stood by the main road and were built on raised ground. Like sentinels of time left alone by development, they reminded me of those I have stepped into in Kuala Terengganu back in the 1960s. These houses are well-ventilated because they were made of timber and had raised floors. During the day, the grilles allow air to move freely. Sunshades were also part of the building to keep strong morning sun out. The roof, if I am not mistaken, comprised asbestos-cement sheets, which also made these houses cooler during the day. To prevent dampness from seeping into the timber stilts which were used to hold up the house, they were placed on cement block footings. This ingenious building method allows the house owner to detect any intrusion by termites and prevent water seepage which would eventually cause the stilts to rot. In some such houses, the airy space beneath the house is used for hanging clothes during rainy weather. Cars and bikes are also parked within. If you notice, this one had a small storage or garage built beside it. There are not many such similar structures around the country and I have not seen one like these two for many years. As such I decided to stop and do a sketch of one of the houses. I did not do a full painting because of the location from where I was seated. It was just at the side of the road that was the main thoroughfare. The cars being driven into Batu Gajah town were not slowing down and from where I sat, it would be difficult for them to spot me as they made the approach. Just as I was about to finish the sketch, a local drove his Proton right into the tiny space by the road in front of where I was seated. Luckily his wife spotted me and asked him to reverse so as not to obstruct my view. I decided to finish the sketch quickly and get out because the car was dangerously perching on the side of the road and inviting an accident.